ARCO regrets to inform its members of the death of Captain Ray Tumulty, of Wicklow Town, on 2 October 2018, peacefully at Blackrock Private Hospital. Loving husband of the late Teresa and loving father of Audrey and Lesley. Sadly missed by his loving daughters, extended family, relatives and friends. Capt PJ (Ray) Tumulty was born in Galway in 1931. His father, one of the early members of An Gárda Síochána, had served with the Irish Guards during the Great War. Ray joined the Defence Forces in November 1950 as a member of 25 Cadet Class and was commissioned as an Infantry Corps Second Lieutenant in November 1952. He served in the Western Command, the Air Corps and at Defence Forces Headquarters. 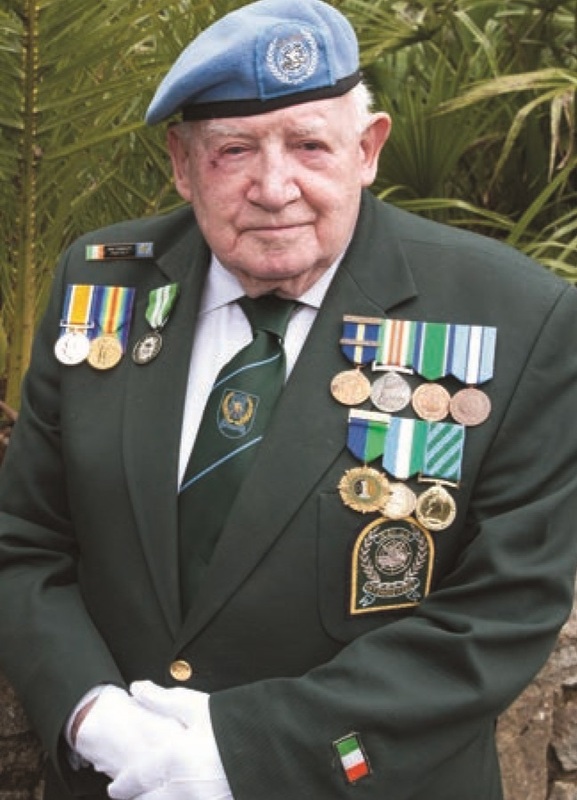 Ray served overseas with the United Nations in the Congo as the Second-in-Command of the Infantry Company, 2 Infantry Group, the last Defence Forces’ unit to serve with ONUC. He joined 3 Infantry Group in Cyprus as a replacement in December 1964 and continued with 4 Infantry Group as Assistant Quartermaster until June 1965. Ray left the Army in 1967 and worked initially in Human Resources. He spend some years as HR Manager with Calor Gas and also worked with IBEC. He was a Vice-Chancellor of Dublin City University. Ray Tumulty was one of the founding fathers of the Association of Retired Commissioned Officers and was its first President from 1993 to 1995. Ray will repose at McCrea’s Funeral Home, Dublin Road, Wicklow Town from 5.00pm to 8.00pm on Friday evening. Removal on Saturday morning at 10.30am to Saint Patrick’s Church, Wicklow Town arriving for 11.00am Funeral Mass followed by interment in Rathnew Cemetery. Family flowers only please. Donations, if desired, to Wicklow Hospice. Enquiries to McCrea’s Funeral Home, Wicklow Town 0404 – 69000.